Seasonal Occurrence: Uncommon on the Bolivar Peninsula in winter, spring, and fall. 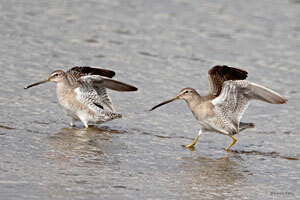 Notes: The two dowitchers found in North America are Long-billed and Short-billed. They are very difficult to tell apart. In general, Long-billed Dowitchers are much more common in Texas, and Short-billed Dowitchers are uncommon. However, on the Bolivar Peninsula the situation is reversed. Long-billed Dowitchers prefer freshwater marshes, and Short-billed Dowitchers are found predominantly in saltwater habitats, but both species can be found in either freshwater or saltwater. They forage in flocks, using their bills like sewing machine needles to probe mud in shallow water. The russet breeding plumage is replaced in winter by soft gray. Their calls are the most reliable clue. For the Long-billed Dowitcher, it is a thin high keekeekeeck, often heard when it takes flight. Short-billed Dowitchers take flight with a soft tututu. Most Long-billed Dowitchers breed in Siberia.